Help support Habitat’s rebuilding efforts in communities most affected by wildfires. My name is Tracy Owens and I’m a single mother of an 11 year old boy, named Cody. I am a very proud recipient of a home from Habitat for Humanity. I will never be able to express my gratitude for this priceless gift of a new, safe and beautiful home. At age 35 I was diagnosed with breast cancer. I went through a double mastectomy a total hysterectomy, reconstruction and 39 sessions of radiation. As I was going through this, 3 months prior to my diagnosis, my Dad was diagnosed with cancer of his esophagus. He had an absolute horrific battle and passed away. Amongst my illness and my Dads death my husband started using drugs and because I have a child and zero tolerance for such recklessness, I had to make the tough decision to end my 9 year marriage. I have also struggled with bi-polar disorder since I was 19 and have had episodes of mania and depression that devasted my life and family. I have had to pick myself up from rock bottom a few times in my life and right before I applied for this Habitat home it was another time in my life where I had to pick up the pieces and put one foot in front of the other to get my life back on track. Needless to say this process of applying for this home and actually receiving it has given me the moral lift and burst of hope in humanity, goodness in this world and the people in it. I was facing having to move because my landlord is selling all of her properties and I was afraid I would find myself homeless. Also, my neighborhood is not safe because drug use and sales is a very huge problem where I currently live. My biggest fear is a drug deal going wrong, and me, my son or my animals being caught in the crossfire. Now, with the help of Habitat for Humanity, I will forever have a home and a safe neighborhood for my son to grow up in, and he will always have a home to call his own. This makes me feel so happy, and a huge weight has been lifted off of my shoulders and I can rest a little easier a night. During this process, I have met such amazing people that work and volunteer for Habitat. My family of friends is growing and I feel like I not only have a home but a huge, solid support system. Habitat for Humanity is just an awesome organization that helps build not only homes, it builds self- confidence, self- worth and a vision for the future. I will forever be an advocate for Habitat for Humanity because it provides the foundation for success and it builds the walls for security and these homes become filled with love that will have a positive impact on the communities that surrounds them. I thank you for supporting me and Habitat for Humanity of Tuolumne County. With 41 affiliates in California, we’re bound to be working in a neighborhood near you! 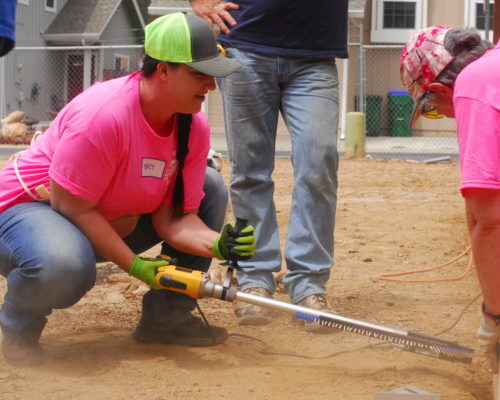 Keep up to date on the work Habitat is doing throughout California and how you can help.